Counseling the Criminal Mind is a new 2-hour online continuing education (CE) course that examines the effects of mass incarceration and provides strategies for reducing criminal behavior. When events such as mass shootings, acts of terrorism, and familicide occur, one question we might ask ourselves is: What goes through the mind of the perpetrator? In attempting to answer this question, this course will explore the many factors that lead to criminal behavior, including traumatic brain injury, genetic predisposition, sibling behavior, exposure to violent video games, excessive television viewing, alcohol abuse, and social cohesion. 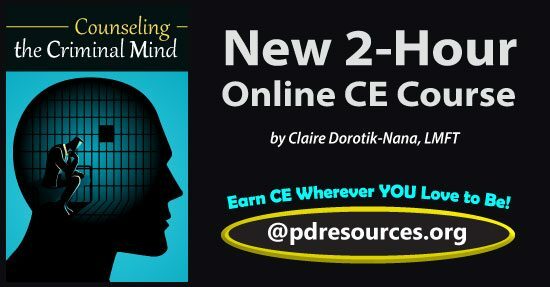 This entry was posted in CE Courses, Counseling CE, Marriage & Family Therapy CE, Mental Health, Psychology CE, School Psychology CE, Social Work CE, Teaching CE and tagged CE, Counseling the Criminal Mind, Criminal, New CE Course by Gina Gunderson. Bookmark the permalink.